St. George welcomed Deacon Stephanos Ritsi, an American missionary who, with his wife, has worked in Albania for the past two years. 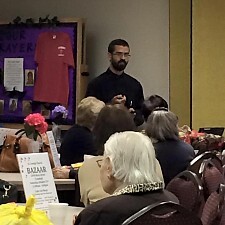 He spoke to the parish about his work in Albania in the Church Hall after Divine Liturgy. Click onto the view slideshow link to view some photos.